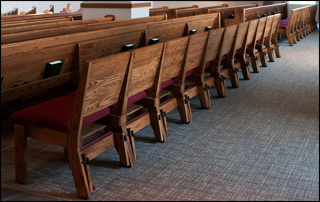 Church Chairs Can Be Stacked And Have Kneelers Installed. We provide the most comprehensive selection of solid oak flexible seating in the country. 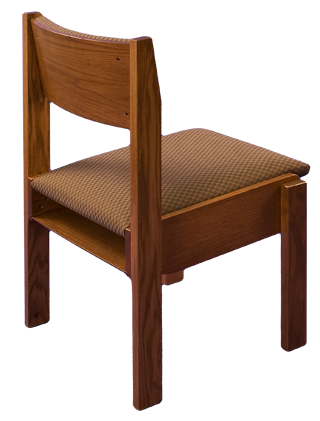 Ratigan-Schottler church chairs are constructed out of the finest Northern grown solid red oak. Other hardwoods are available on request. 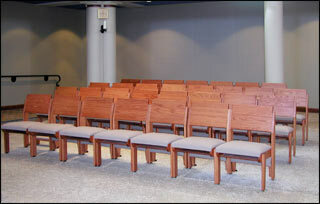 Sanctuary chairs, chapel and choir chairs are specifically designed for worship use. They can be stacked or ganged together and most are available in multiple widths. A variety of other convenient options, including removable fold-up kneelers and ganging clamps are available. 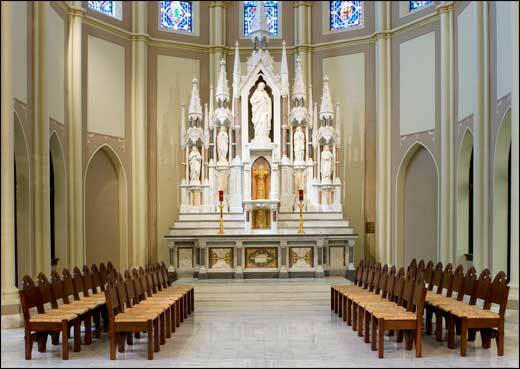 Our skilled and experienced craftsmen, specialize in custom church chair construction. 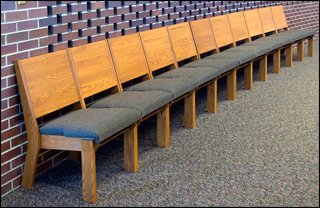 Our standard stackable church chairs can be modified to fit your design or space requirements. Please contact us for our complete flexible seating chair catalog. If you would like to receive more information about our church chairs for sale or any of our other products or services, please call us at 800-383-1000. We will provide you with any information you need, including pricing, a product request or advice for planning. Custom Sanctuary Chair With Rush Seat. St. John, Creighton University in Omaha, NE. 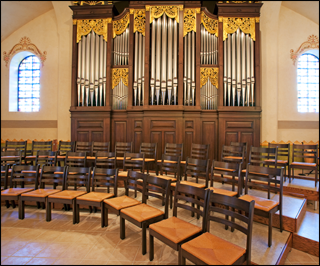 We provide the most comprensive selection of church chairs available. We specialize in custom chairs to meet your design requirements. Super Chair II shown ganged together providing for a continuous seating surface. Ladder Back Chair with rush seat. Super Chair II shown from the back with optional solid oak snap-on, snap-off removable kneeler. Super Chair I shown ganged together.